Born in Odessa (Ukraine). He studied at the Stolyarsky Music School, then brilliantly graduated at the Central Music School of the Moscow Conservatory (class of Honored Artist of Russia Abram Yampolsky). In 1953 he graduated at the Moscow Conservatory (class of the same teacher), in 1958 - postgraduate studies (after the death of Abram Yampolsky class of People's Artist of Russia David Oistrakh). Laureate of the International Tchaikovsky Competition in Moscow (1958). Since 1989, he teaches at the Violin Department of the Moscow Conservatory, since 1990 - professor, over a period of 1995-1998 - Head of the Violin Department. Since 2007 he is Head of the Violin Department under his own leadership. He regularly conducts master classes in Russia and abroad. Since 1949, he is giving, since 1953 as a soloist of the Mosconcert, since 1975 with Moscow State Philharmonic Society. In 1964 he became a member of the piano trio composed of: E.Malinin, N.Shahovskaya, which has become one of the leading chamber orchestras of the country. He has performed with the best orchestras in the world. Since 1990 he has been acting as a duet with Honoured Artist of Russia, pianist Valentina Vasilenko. Eduard Grach repertoire comprises over 700 music pieces. It also acts as a violist. The first performer of more than 50 music pieces for violin and viola. Many composers devoted to him as voiolinst their master pieces: L.Afanasyev, I.Akbarov and A. Baltina – concerts, Y.Krein and A. Eshpai - sonates, and I.Frolov - Concert Fantasy on the Gershwin's Opera "Porgy and Bess" I. Frolov. Engaging his class graduates Eduard Grach organized the Chamber Orchestra "Muscovia" and become its permanent conductor and artistic director. Expert Commission of the newspaper "Music Review" granted him as the Best Music Teacher of Russia in 1995, 2002 and 2003. In 2005, he was awarded as the Best Music Teacher in South Korea. 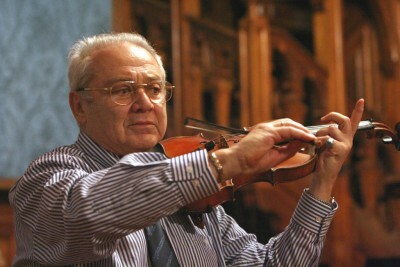 Academician of the Monti Azzuri Italian Academy, Emeritus Professor of Shanghai and Sichuan Music Conservatory in China, Emeritus Professor of the Yakutian High Music School, Emeritus Professor at the Indianapolis University in Athens (Greece), Emeritus Professor of master classes "Keshet Eilon" (Israel). He was awarded with the Order for Merit to the Fatherland IV (1999) and the Order for Merit to the Fatherland III (2005). He was honored with Commendation of the President of the Russian Federation "For Major Contribution in Music Arts" (2002), and Winner of Moscow Prize (2004). According to Classical Music Archives he is Artist of the Month (October 2005). He was awarded with the Medal of the International Fund for Eugene Ysaye. Laureate of the State Prize of the Republic of Sakha (Yakutia) (2009). He takes part in the jury of national and international competitions. Eduard Grach has recorded more than 100 LP records. Many records were also released on CD. His video presentations can be viewed on YouTube.